Yesterday’s afternoon snack at ‘Ino. If you’re making a dash to the grocery tomorrow, don’t forget about cocktail hour. The chefs in your family will appreciate a snack they did not have to prepare, and guests will be building an appetite as the smell of roasting turkey permeates. Here are some simple savory applications using pumpkin–all three can be prepared with just one 15 oz can. Thanks to Diana from the Greater New York Hunger and Environmental Nutrition group for these inspirations! In a medium mixing bowl, combine the cream cheese, pumpkin and spices. Stir in the sour cream. Garnish with the pumpkin seeds. Serve with sliced apples. Add all ingredients to a saucepan. Bring to a simmer over medium heat while stirring. Cook until all ingredients are well combined. Brush the sauce over shrimp while grilling or broiling. In a small bowl, combine pumpkin and spice. Split the wheel of Brie horizontally (you can freeze beforehand to make this step easier). Spoon pumpkin on the bottom half and replace the top. Dip Brie in egg, then coat with nut and seed mix. Bake 15 minutes or until warm and toasty. Serve with sliced apples, pita chips, or cinnamon-raisin bagel chips. If you are cooking for Thanksgiving, chances are you have started stockpiling ingredients, or will be hitting the market in the next few days. Personally, I’m anxious about what I will encounter tomorrow at the 74th St. Fairway market. A typically tense shopping trip at Fairway turns aggressive and underhanded come holidays. But I’ll stick to my usual concessions, yielding to double strollers and a few granny pushcarts. The rest of you, watch out. My Grandmother, Florence, will be hosting the big day this year; so, our bird will be chilling in Long Island until I arrive with the salt rub. Nevertheless, it’s time to clear our city fridge for appetizer ingredients and potential leftovers. 1. On a backburner, heat 1 qt broth + 2 cups water in a 2 qt saucepan until simmering, then turn to low to keep warm. 2. Meanwhile, chop the squash and mushrooms into a 1/2″ dice. Finely-chop the onion. Heat 1 Tbsp butter + 1 Tbsp olive oil in a 4 qt saucepan; saute the onion until translucent. Add 1 1/2 cups barley and stir until just toasted, and sweet-smelling. Add a splash dry sherry and 1/2 cup red wine; stir until most of the wine evaporates. 3. To the barley, add 2 ladles of broth, mushrooms and squash; stir until starting to bubble. Continue to stir and add a ladle of broth as the liquid is absorbed. Be sure to stir frequently to prevent barley from sticking. Continue this process for 25-30 minutes. The squash should break down and melt into the cooking liquid, adding sweetness to the earthy mushrooms. 4. Once the barley is tender, but chewy, turn off the heat. Add about 2 tsp butter and stir quickly until thickened. Add about 1/4 cup Pecorino cheese and stir. Serve with additional cheese if you’d like. Makes 4 servings, which means I don’t have to cook tomorrow night. Smile. Elaine found a good one at Monk’s. I’m still searching. $15 for an entree salad seems criminal when last week I spent $15 on a grassfed beef steak from Fairway Market that fed the two of us, generously. In the meantime, we started the weekly tradition of Big Salad night at home. It’s a great way to use up raw veggies (just take a grater to them) and fill up on cheap protein like beans and hard-boiled eggs. Here’s the recipe from yesterday’s post. I’ve adapted Laura’s recipe to include our final farm share vegetables, and I think I did them proud. Helpful tip, when you’re out of tomato paste (or don’t want to buy any), ketchup does just fine, as it did for me here. Also, by some divine intervention, there were exactly two Brooklyn Brewery Post Road Pumpkin Ales in the way back corner of the fridge. The combo of spicy notes with creamy peanut butter was a smashing success. Enjoy, and please let me know if you try it! In a large saucepan, saute the onion and garlic in the canola oil until soft, about 5 minutes. Add the tomato paste; stir until combined. Cook 1-2 minutes. Add the peanut butter and 2 C broth; stir until well combined. Add the potatoes, turnips, carrots and bay leaves. If the liquid does not cover the vegetables, or seems to thick, add remaining broth as needed. Season with 1/2 tsp salt & pepper. Bring to a boil, then return to a simmer. Cook for 30 minutes, stirring frequently to prevent the peanut butter from sticking to the pan. Add the bok choy and cook an addition 5-10 minutes. Season with salt & pepper to taste, and serve over rice. Greetings and thanks for dropping in for a read! Thought I’d start out with a quick intro to my blogging surroundings. I live in Greenwich Village in New York City with my husband, Matthew. We’re located just 4 blocks due east from the childhood home of my maternal grandmother. The Italian one with the good cooking genes. So, although we hail from the Heartland, I’m somehow “granddaughtered” into this whole Manhattan/New Yorker thing. 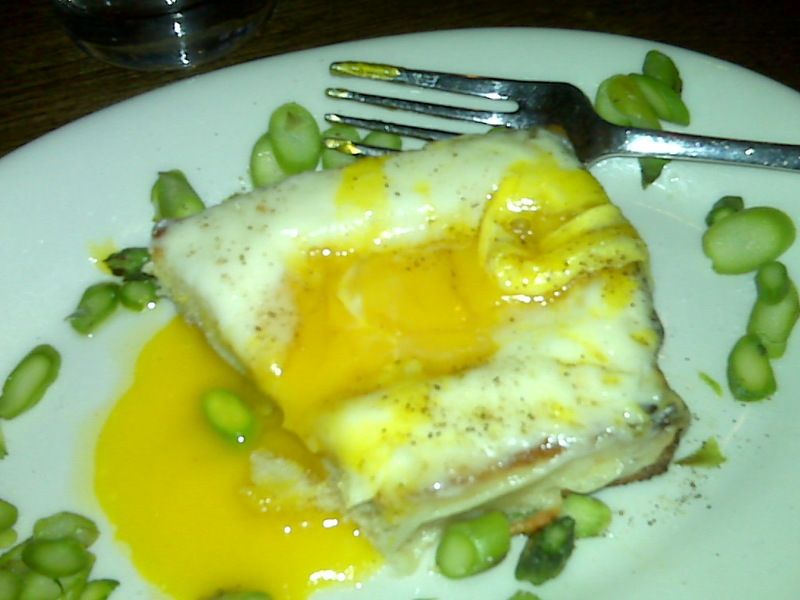 In our neighborhood there are volumes of noteworthy restaurants at our fingertips. We take advantage as often as possible, but also enjoy the authentic eats that await in the outer boroughs. Fortunate for us, it looks as though that one-time suburban enclave of my grandparents (post Manhattan, pre-Long Island) could soon be home. Brooklyn bound! So, my impetus for starting this blog, well, was you! I thought I’d finally answer the question I get asked repeatedly as a chef, “Do YOU cook at home?” The answer to this has not always been a resounding yes…8-10 hours on feet, around kitchen smells & tasting food does not equal enthusiasm for another round off the clock. The question I get as a nutritionist is, WHAT do you eat? What’s in your fridge? So…let the blog be your guide! 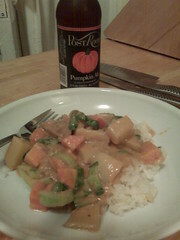 Recently a co-worker, Laura, shared her recipe for Peanut Butter Stew that she made as a Peace Corps volunteer in Mali (the country), Africa (the CONTINENT). 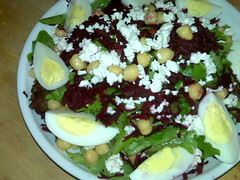 The root vegetables and greens from the CSA lended perfectly to the recipe, and I tried it out with delicious results. I will post my rendition. I know the economy is in the dumps, but if I see that commercial for Kraft Singles grilled cheese-to-get-you-through-the-hard-times, one more time, I’m going to lose it… let me tell you, peanut butter stew is also a good way to go in terms of your wallet. Of course, I’ve joined the thrifty club with the rest of the country. Dinner at Per Se is out for now–unnecessary pork barrel spending (mmm, pork barrel sounds tasty)–fridge to nowhere, no doubt about it, I’m dining-in. Check out the recipe. And come back for seconds!